Since the earthquake in Nepal on April 25th, travel companies from across the world have launched fund raising drives to help the country’s people. Intrepid’s non-profit arm the Intrepid Foundation received more than $40,000 within the first 24 hours of launching its appeal. The speed and scale of responses like this makes two things immediately clear: these companies have sizeable networks of supporters who trust what they say, and there are a lot of tourists who want to help. She’s right. However, there is one way (that I have so far come across) where people with few skills beyond the ability to use a computer can help the victims of this particular disaster. Since the quake happened, Indian travel company The Blue Yonder has been encouraging its many supporters on social media to get involved in helping rescue efforts reach remote mountain communities – and to do it without leaving their own home. This rare example of impactful armchair activism has been made possible thanks to a remarkable online project known as OpenStreetMap. At its very simplest, it works like this: A lot of the affected areas in Nepal are without any usable maps, meaning rescue teams have pretty well no directions to guide their operations. Villages such as Swarathok village in the hilly district of Sindhupalchowk have been decimated by the earthquake, yet owing to lack of access and visibility, they have also been isolated from any sort of aid. OpenStreetMap is a crowd sourced, collaborative effort to map the world. (It looks like Google Maps in many ways, but with key differences in terms of transparency and ownership). In the days since the disaster, 1000s of volunteers, with more joining by the day, have been adding, editing or removing content on online maps of the region. Using satellite imagery as a guide, users may simply trace paths, settlements or waterways, thus creating maps of various locations and how to reach them. 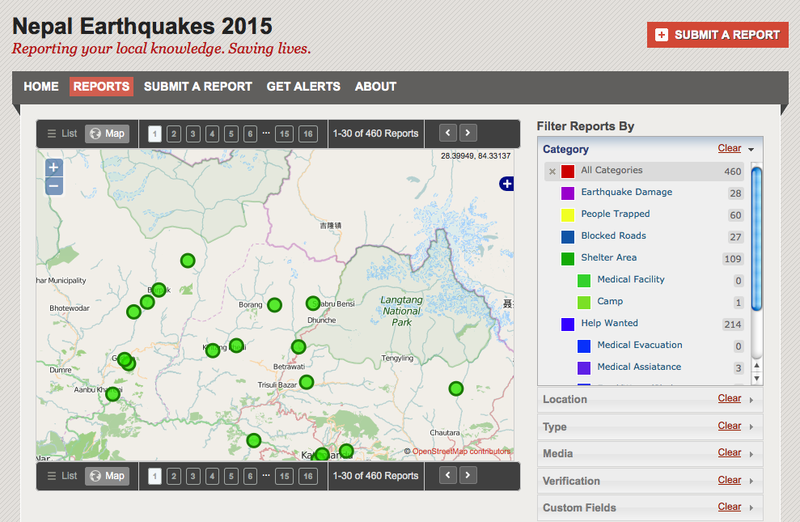 It’s also being used by people on the ground in Nepal to call attention to where specific problems are. This mapping initiative has already been written about on technology websites such as Wired and Fast Company, but so far received little coverage in the travel press. The Adventure Travel Trade Association has recognised the Blue Yonder’s efforts and highlighted it on their website here. Ethical Travel Portal, a Norwegian operator that takes regular trips to Nepal, has posted regularly about it on social media. Yet the networked nature of tourism puts the whole industry in a strong position to spread the word and support such an initiative. And nothing is more central to or evocative of the urge to travel than the map. One post on the topic on The Blue Yonder’s Facebook page has had 22,000 hits in a matter of days. On the 4th May the company’s website has had 27,931 hits. And this is for a small company working out of one office in Pondicherry. Imagine how many people could hear of this if a few global companies helped spread the word. It could be as simple as a tweet, sharing this facebook post, a donation to boost such posts to more followers, or a link on a company’s homepage for the next few days. Because the more people that spread the word, the quicker these maps get drawn, and the more people that can be helped. To find out how you or your company can help, click here.